November Professional Genealogist Gabe Blaschuk will answer your genealogical research questions. Members may speak for 3 to 5 minutes about their inquiries. Topic: DNA Explained: A look at the basics of DNA analysis for genealogy and how to get the most out of your test. Topic: The Influential Role Played by the Parish of St. Peter’s Church Cobourg in the Development of Upper Canada. 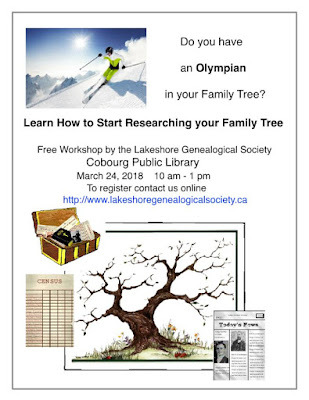 The workshop participants will discuss the reasons for research, learn where to look for family information first, be given ideas about how to track findings as well as lists of local and regional resources that are available for free. Lots of helpful hints will be provided and your family chart will be started on the day of the workshop. Materials will be available free of charge. We are excited and honoured to host Dr. Janet Braund Few on her cross-Canada tour at our Oct 8 meeting where she will present Faith, Fish, Farm & Family - Immigration from North Devon 1830-1900. Port Hope-Cobourg became the cradle of the Bible Christian movement in Canada due to missionaries from Devon. Dr. Few is a "rockstar genealogist", historical interpreter ("Mistress Agnes") and author from Exeter, England whose PhD thesis studied communities in North Devon and their migratory patterns. 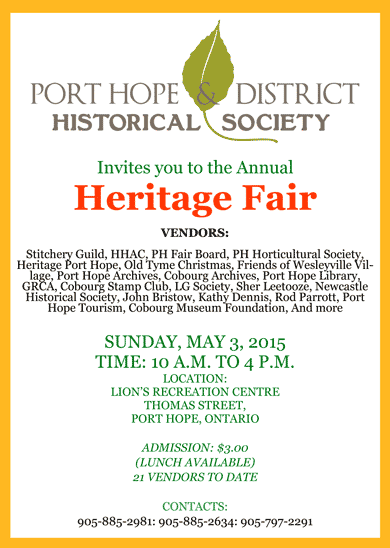 Drop by the Port Hope Lions Club and meet some of our members; see examples of family history books, presentations and research resources; search regional cemetery database; start your family tree with our help. Janice Millard, Curator, Archives, Special Collections, and Rare Books and Gifts of Trent University Archives brought several artifacts from the Archives to illustrate her presentation. The photo above shows a sample of very dense cross-writing from the early 19th century when paper was very expensive. The writer would write across an already written page at 90 degrees - two pages in one and sometimes four, if she also wrote diagonally! Ms Millard described how the collection can aid in researching family history and genealogy, especially for Peterborough and adjacent counties. To explore what is in the Archives, visit the Trent University Library main site and click on the link "Archives & Special Collections". 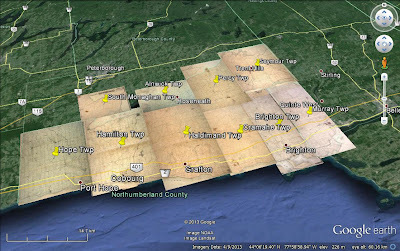 Check out our new feature - we have overlaid the maps from the Illustrated historical atlas of the counties of Northumberland and Durham, Ont. Toronto : H. Belden & Co., 1878 onto Google Earth for a nifty way of exploring this area. See 1878 Northumberland in Google Earth. Did you know that residency in either municipality entitles you to borrowing privileges at both's Public Libraries? I didn't, or, if I was told when I joined CPL some 4 years ago, I have forgotten. Thanks, PHPL and CPL! The PHPL website, under the menu Library Info > How to Get a Library Card, says: "Library borrowing privileges are also extended to members of the Cobourg Public Library." Under the menu About > Library Membership, the CPL website says: "Any permanent resident of Cobourg or Hamilton Township and any resident of the Municipality of Port Hope, is able to get a Library card at no cost."